Girard, Charles. "Alfred De Sève". The Canadian Encyclopedia, 13 December 2013, Historica Canada. https://www.thecanadianencyclopedia.ca/en/article/alfred-de-seve-emc. Accessed 25 April 2019. Alfred De Sève (DeSève, Desève). Violinist, teacher, composer, (b St-Henri [Montreal] May or June 1858, d Montreal 25 Nov 1927). 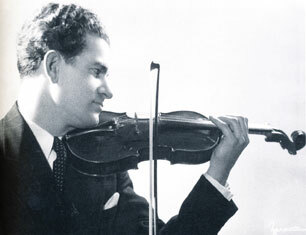 He began violin study at seven with Oscar Martel and made a promising debut six months later. He also was taught by Frantz Jehin-Prume. In 1876 De Sève went to Paris for studies, briefly with Sarasate, then with Hubert Léonard and Lambert Massart. During three years as a pupil of Henri Vieuxtemps he developed a career in Paris under the patronage of the Queen of Spain, Isabelle II, who made De Sève her court violinist. His reputation established, he returned in 1879 to Canada, where he gave many concerts. In 1880 he married the pianist Joséphine Bruneau, who also became his accompanist. Moving to the USA in 1881, he soon began teaching at the New England Cons in Boston, and in 1891, on the death of Calixa Lavallée, succeeded him as choirmaster at Holy Cross Cathedral. De Sève was a member of the Boston SO, and his solo appearances with the orchestra - 18 Feb 1882 in Mendelssohn's Concerto in E Minor and 15 Dec 1883 in Saint-Saëns' Introduction and Rondo Capriccioso - were among the earliest by a Canadian soloist with a major US orchestra. He was concertmaster of the Boston Philharmonic Orchestra and made several tours of the USA as a member of the Boston Symphony Orchestral Club. In 1899 he returned to Montreal to teach violin, privately and at the McGill Cons, and to manage his considerable personal fortune. His pupils included Alexander Brott, Noël Brunet, Albert Chamberland, Eugène Chartier, Marcel Saucier, Lucien Sicotte and Ethel Stark. De Sève wrote compositions for violin and piano, solo piano, and orchestra, published by Ditson and Arthur P. Schmidt. In 1931 a Montreal street was named after him. A De Sève Quartet, consisting of Philippe Djokic and Marcelle Mallette, violins, Douglas McNabney, viola, and Pierre Djokic, cello, was founded in Montreal in 1989 and made its debut the same year at the Festival superphonique in Lachine.